We’d love your help. Let us know what’s wrong with this preview of What She Never Said by Catharine Riggs. Ruth Mosby is the VP of operations at Serenity Acres, where the privileged elite go to die. For a hefty fee, wealthy retirees can live the good life in this posh Santa Barbara community—even after they outlive their money. Ruth thinks this is a fine arrangement, but the savvy new boss has a People are dying at a luxury retirement community . . . and not from natural causes. Ruth Mosby is the VP of operations at Serenity Acres, where the privileged elite go to die. For a hefty fee, wealthy retirees can live the good life in this posh Santa Barbara community—even after they outlive their money. Ruth thinks this is a fine arrangement, but the savvy new boss has a new rule: if you can’t pay, you can’t stay. Ruth is deeply disturbed when destitute residents start dying at an alarming rate, as if on cue. Even more troubling, a macabre note accompanies each departed guest. Surviving guests whisper about an “Angel” who assists with suicides. Ruth has another word for it: murder. To ask other readers questions about What She Never Said, please sign up. I received an eARC of this book from Netgalley an Catharine Riggs in exchange for an honest review. "You see, we all have our regrets. Our wounds. What matter is how we live today". This story is told from two perspectives, Ruth and Zach. Both have lost their way personally and professionally and share a dark secret. Around them, resident at the assisted living community where they work are dying. Are they being helped to make a choice to end their lives or is there something more sinister happen I received an eARC of this book from Netgalley an Catharine Riggs in exchange for an honest review. This story is told from two perspectives, Ruth and Zach. Both have lost their way personally and professionally and share a dark secret. Around them, resident at the assisted living community where they work are dying. Are they being helped to make a choice to end their lives or is there something more sinister happening. Ruth Mosby is the VP of Operations at a luxury retirement community. Ruth is very strict and doesn’t like it when rules aren’t followed. So when the retirement home is sold to a new company, things don’t sit well with Ruth. The new company wants destitute residents out. There have been residents dying under unusual conditions and someone called the “Angel” is responsible. Some of these deaths seem to be assisted suicide when there is evidence of a “club” of elderly residents who want to decide w Ruth Mosby is the VP of Operations at a luxury retirement community. Ruth is very strict and doesn’t like it when rules aren’t followed. So when the retirement home is sold to a new company, things don’t sit well with Ruth. The new company wants destitute residents out. There have been residents dying under unusual conditions and someone called the “Angel” is responsible. Some of these deaths seem to be assisted suicide when there is evidence of a “club” of elderly residents who want to decide when they die. However, others start to die including destitute residents and others with secrets no one knew about. Ruth enlists her neighbor Zach, a retired police officer, to work as a security guard and to help her investigate the deaths. An excellent thriller! Kudos to the writer for bringing the characters to life, and for making the plot so fascinating. I enjoyed the book very much and woul love to read more by this talented author. This book deals with a serious issue that is ripped from current head lines. It deals with a nurse in an elderly home who helps the residents cross over. This is a thought provoking read about assisting suicide and its implications morally, legally and psychologically. This isn't an easy read but it held my attention through out and I think it will stay with me for sometime. Thanks Netgalley, the publisher and the author for an ARC in exchange for a honest opinion. More of a mystery then thriller. Not an author I’m familiar with but would certainly read another of her novels. Fast read,, easy read. Ruth works as a director at Serenity Acres - a "life care community" in Santa Barbara, California. Ruth is cold and can be uncaring to her employees...and they know it. A patient with terminal bone cancer is assisted in dying by an "Angel" who keeps a Crossing Journal of all those (7 so far) who have passed on with his/her help. A common thread seems to be a pink post-it with the patient's name and a date & time. And what is the Goodnight Club? Sarah and her children, Adam & Alice have str Ruth works as a director at Serenity Acres - a "life care community" in Santa Barbara, California. Ruth is cold and can be uncaring to her employees...and they know it. Zach finds out that Kai has some lethal weapons and is taking martial arts classes. .Adam starts back on his drug habit and gets a kitchen job at Serenity. There, he meets Ember, a night carer. At some point, Zach's old buddy from the force becomes the detective on happenings at Serenity. A good story with characters that are believable (yet mostly unlikeable!) Some surprises along the way and overall an enjoyable read. Thank you to NetGalley and the publisher for this ARC for my honest review. I had a really hard time with this one. It was very slow and just did not hold my attention. I do not like to DNF a book but I was not able to finish it. Reader. Writer. Hiker. Runner. 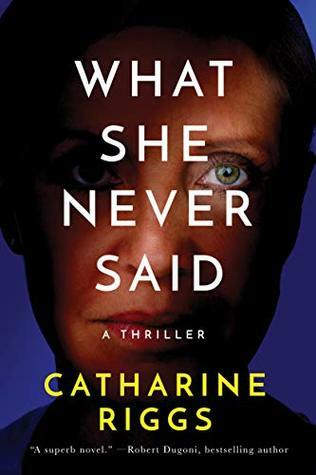 Author of the debut thriller WHAT SHE GAVE AWAY and the upcoming WHAT SHE NEVER SAID launching 9.10.19.